If you like shots in the form of jello i found this really nifty idea. 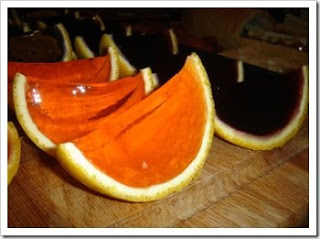 Orange Jello shots. Looks really cool, like some DNA project turned bad/awesome. They are orange slices except instead of the orange part you got Jello on the peel. Get Happy, and Be Safe.